All I’m saying is that when you create your very first draft, do it as quickly and as roughly as you possibly can. Your first strokes need to be broad, bold, decisive! Then, as you gradually slide from WHAT to HOW, you can also gradually get slower and more careful. The following is relevant for all forms of creative work, including writing (anything from short stories to academic papers), design, animation, composing, and everything else. Have you ever spent a lot of time on a piece of creative work, only to realize that you’ve completely lost sight of what you were initially trying to make? I know I have. Before I started studying the creative process, this kind of thing used to happen to me a lot. Not anymore, though. Here’s what I do now: I start out FAST. Whether I write, draw, animate or sculpt, I usually complete a rough and dirty version of the piece within 20 minutes or less. This is called blocking, and it’s a very effective solution to the problem of getting lost. 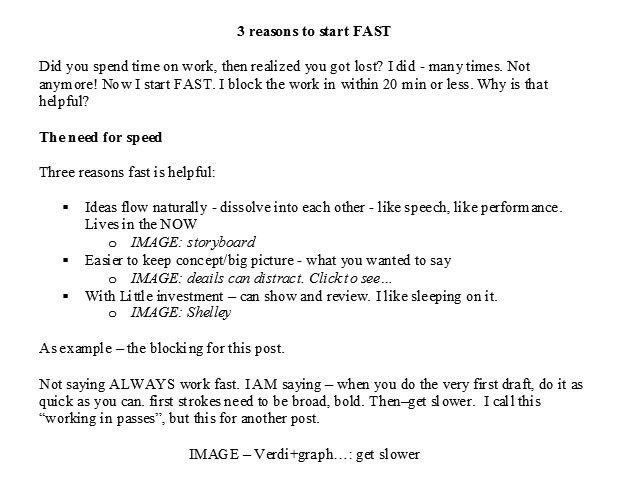 Here are 3½ reasons why starting out FAST can be a real creative life-saver. When you work quickly ideas flow naturally, smoothly dissolving into each other. It’s like speaking, like giving a live performance. When you work quickly, your artwork has that vibrant quality of something that lives in the moment. For the rest of the project you’ll have a job trying to preserve that energy; but at least it’s there to begin with! A quick draft is like giving a performance. It may not be perfect, but it has that vibrant energy of something that lives in the moment. When you work slowly, the many little details of your work capture your attention. They can easily divert your focus and distort your perception of your work. Working quickly keeps you focused on the big picture, on your initial vision, and on your concept. It helps you make sure your WHAT is there first; then you can safely tinker with the HOW. Capturing quickly and well is the fundamental skill of the creative process. In my video course Go*Capture I teach a lot of great tips and techniques on how to get better at it. 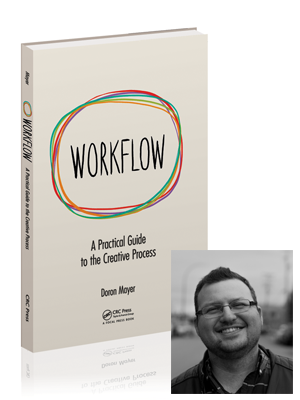 For more information and a special price for CreativityWise readers, click here. 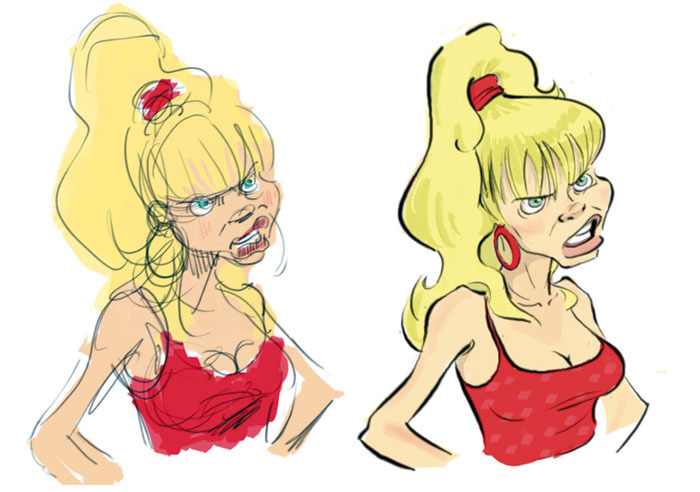 Working fast helps lay out the overall shape of your subject and postpone all the fancy distracting details. Do you see what’s special in this picture? If you don’t, click on the image to remove the distracting details… Do you see it now? Blocking in a quick and rough version of your work allows you to review it – and get feedback on it – before you’ve invested too much time in it. That’s actually a double advantage (hence the extra ½ reason! ): you get to be less emotionally attached to what you did, and changes take less time. In this illustration, the quick draft allowed me to get some feedback very early on. 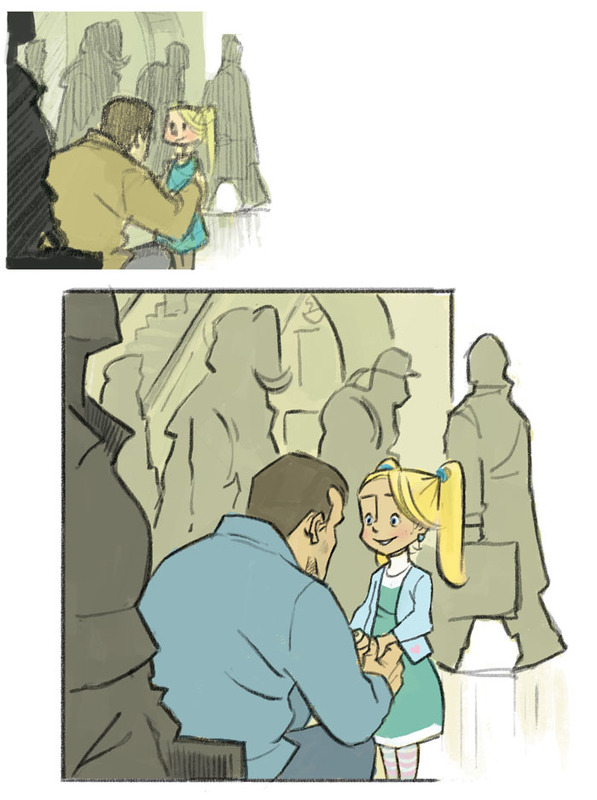 The author and editor asked for Dad’s arms to hold the girl’s hands instead of her shoulders. Had they asked for it after I’ve invested a few hours of work, it would have been a problem; at this early stage, it was a very easy fix. Here’s how I blocked in the post you’re now reading. See how I let ideas flow like free speech, how I capture the WHAT without the HOW, and how easy it is to review and get feedback on my ideas when they’re in this condensed form? See how painless it is to revise? I’m not saying you should ALWAYS work fast. Slow, delicate brushstrokes also have a role to play. All I’m saying is that when you create your very first draft, do it as quickly and as roughly as you possibly can. Your first strokes need to be broad, bold, rough! Then, as you start shaping your work, as you gradually slide from WHAT to HOW, you can also gradually get slower and more careful. This is called ‘working in passes’, but we’ll save that for another post. 3½ reasons to start out FAST! Can working faster actually improve your results? Is Your Computer Killing Your Ideas? Everything in the digital world is easily undo-able, resize-able, zoom-in-able, copy-paste-able and changeable. But is that really a good thing? My uncle David used to have a typewriter. This was 30 years ago, when a personal computer was still quite a new concept (let alone a home printer). As a kid who loved to read, the typewriter was an exciting and magical instrument for me: with it, I could literally create ‘real’ books! 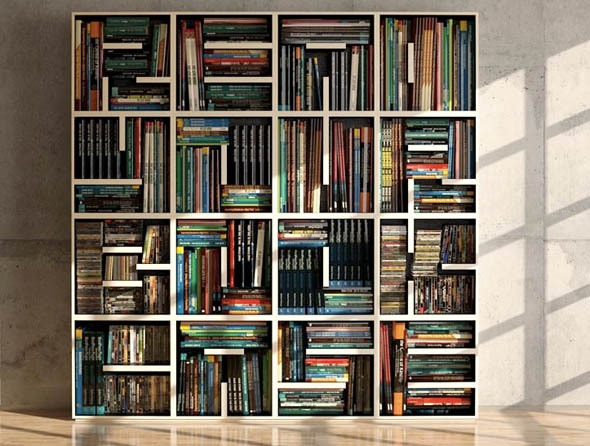 Author Doron MayerPosted on 30 Oct 2018 8 Nov 2018 Categories ArticleTags tipsLeave a comment on Is Your Computer Killing Your Ideas? Be reckless; be bold; be messy; be silly; be crazy. You can worry about elegance and craftsmanship later; that is, when you revisit and revise your work. 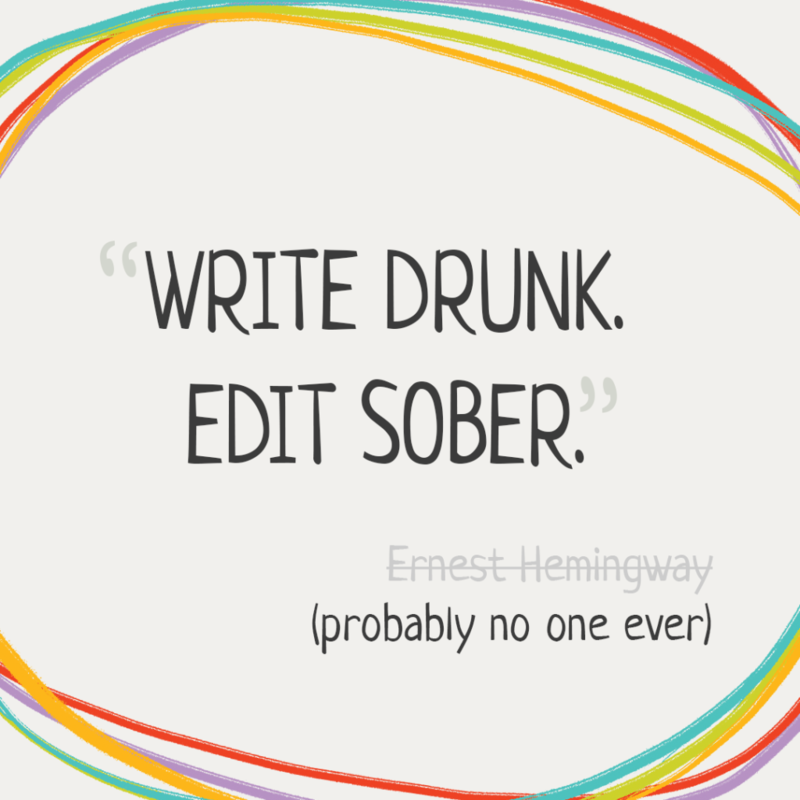 The advice “write drunk – edit sober”, often attributed to Ernest Hemingway, was never given by him – probably because it’s a terrible advice. (link: a report from someone who actually tried it). Everyone loves talking about passion. And yes, passion is a crucial component in your success as a creative professional (and anything else, really). But there’s also something to be said for dispassion. I’m talking about the ability to take a step back and make your decisions not as a passionate emotional artist, but as a cold and calculated pro. This video presents one of the core ideas of Worklfow in under 4 minutes. If you prefer reading, a transcript appears below. When I was a kid there was a famous series I used to watch, called The A-Team. In case you’re not familiar with it: it’s about a group of 4 guys, each with a unique personality and a specific set of skills. Hannibal was the man with the plan and a master of disguise; BA was a hot-headed muscle man and an excellent driver; ‘Face’ was a con artist with a soft spot for pretty girls; and Murdock was the barking mad pilot who could fly anything. And of course, every mission these guys had, somehow required most of these skills. I was reminded of this TV series because in fact, every creative effort is a bit like an A-Team episode. It requires four different mindsets – four distinct personalities with different skills and attitudes.